Outsourcing is an emerging phenomenon in the healthcare information technology market. It is a screening process wherein an organization selects the most efficient third-party service provider to effectively operate its management and administrative unit. Outsourcing of IT solutions in the healthcare industry has emerged as an efficient solution to mitigate rising healthcare costs and to meet the growing demand for quality care. Over the years, the trend of healthcare IT outsourcing solutions has grown significantly among large organizations and has also attracted mid-sized organizations. In some cases, the entire information management system is outsourced, while in others, only key application services such as implementation of EMR, CRM, and billing systems are outsourced. The market for this report has been segmented by application and by industry. 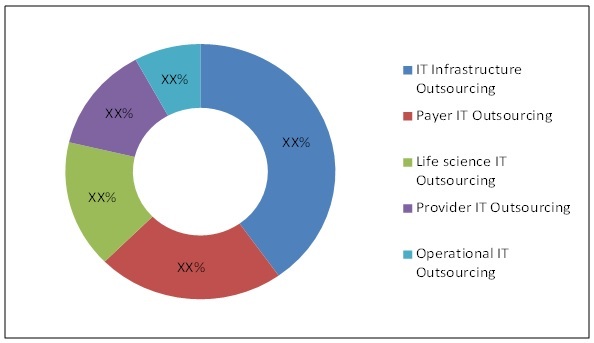 The application market is further classified as provider healthcare IT outsourcing, payer hcIT outsourcing, life science hcit outsourcing, operational IT outsourcing, and infrastructure IT outsourcing, while the market by industry is segmented as healthcare (including hospitals, diagnostic laboratories, and clinics), biotechnology, pharmaceutical, clinical research organizations, and health insurance. The global market is forecast to grow at a CAGR of 7.6%, to reach $50.4 Billion by 2018 from $35 Billion in 2013. The health insurance industry, healthcare systems industry, and pharmaceutical industry are driving the HCIT outsourcing market. These industries follow the healthcare IT outsourcing model to enhance their focus on core business, reduce operational and maintenance costs, increase access to IT skilled and trained staff (further reducing hiring and training costs), share risk, and quickly implement new technologies. Factors propelling the growth of the healthcare IT outsourcing market are the rising pressure to curb healthcare costs across the globe and the growing need to manage cash flow in back-office administration and IT management systems of healthcare provider, payers, and the life science segment. Lack of in-house IT expertise, rise in demand for integrating solutions, growing pressure on healthcare providers to meet the “Meaningful Criteria” set by the U.S. Federal Government, new ICD-10 conversion guidelines for coding, rise in aging population, and growing medical tourism in Asia are also likely to drive this market. However, factors such as the fragmented nature of the healthcare system and HCIT outsourcing market, requirement for high investment in outsourcing IT solutions, growing concern for data security, and cultural and language barriers restrain the growth of the market. North America accounts for the largest share - 72% - of the global healthcare IT outsourcing market and is expected to reach $36 billion by 2018 from $25 billion in 2013. Asia-Pacific and RoW are expected to register CAGRs of 8.1% and 7.8% (2013 to 2018) respectively, followed by North America (7.6%), and Europe (7.2%). Major players in the market are Accenture Plc. (Ireland), Accretive Health, Inc. (U.S.), Allscripts Healthcare Solutions, Inc. (U.S.), Anthelio Healthcare Solutions (U.S.), Cognizant Technology Solutions (U.S.), Dell, Inc. (U.S.), HCL Technologies (India), Hewlett-Packard Company (U.S.), International Business Machines (IBM) Corporation (U.S.), Infosys Limited (India), McKesson Corporation (U.S.), Siemens Healthcare (Germany), Tata Consultancy Services Ltd. (India), Wipro Ltd. (India), Xerox Corporation (U.S.), Epic System (U.S.), and Computer Sciences Corporation (U.S.). The research report categorizes the healthcare information technology outsourcing market by delivery mode, by components, and application. These markets are further broken down into segments and sub-segments. The introduction of information technology in the healthcare and life sciences industries has quickened the healthcare process, thereby reducing costs while efficiently managing huge amounts of patient data. However, the adoption rate of healthcare information technology is still low in many regions due to the high costs incurred for implementation, maintenance, and up-gradation services; poor in-house IT skilled resources; and inadequate IT infrastructure. Outsourcing has emerged as an effective tool to combat these challenges. Outsourcing enables the healthcare and life sciences industries to focus more on their core businesses. Furthermore, it offers various benefits such as reduced operating costs, access to skilled resources, quick deployment, flexibility in the choice of technology and modules, improved cash flow, and risk sharing. The global healthcare IT outsourcing market is forecast to grow at a CAGR of 7.6%, to reach $50.4 billion by 2018 from $35 billion in 2013. The market for this report has been segmented by application and by industry. The application market is further classified as provider IT outsourcing, payer HIT outsourcing, life science HCIT outsourcing, operational healthcare IT outsourcing, and infrastructure healthcare IT outsourcing. Provider HCIT outsourcing is further segmented into electronic health records (EHR), laboratory information management system (LIMS), pharmacy information system (PIS), and revenue cycle management (RCM) systems. Payer HCIT outsourcing includes the following sub-segments, namely, customer relation management (CRM), claim processing, billing system, and fraud and detection. Life science HCIT outsourcing is divided into enterprise resource planning (ERP), clinical trial management system (CTMS), clinical data management system (CDMS), and R&D IT services. The sub-segments of operational HCIT outsourcing included for study are supply chain management (SCM), and business process management (BPM) outsourcing. IT infrastructure outsourcing is further divided into two prominent sub-segments, namely, infrastructure management services (IMS), and cloud computing. The market by industry is segmented as healthcare provider system (including hospitals, diagnostic laboratories, and clinics), biotechnology, pharmaceutical, clinical research organizations, and health insurance. Factors propelling the growth of the market are the rising pressure to curb healthcare costs across the globe and the growing need to manage cash flow in back-office administration and IT management systems of healthcare providers, payers, and the life science segment. Lack of in-house IT expertise, rise in demand for integrating solutions, growing pressure on healthcare providers to meet the “Meaningful Criteria” set by the U.S. Federal Government, new ICD-10 conversion guidelines for coding, rise in aging population, and growing medical tourism in Asia are some of the other factors that are also likely to drive the healthcare IT outsourcing market. However, factors such as the fragmented nature of the healthcare system and healthcare IT outsourcing market, requirement for high investment in outsourcing IT solutions, growing concern for data security, and cultural and language barriers restrain the growth of the market. Major players in the healthcare IT outsourcing market are Accenture Plc (Ireland), Accretive Health, Inc. (U.S.), Allscripts Healthcare Solutions, Inc. (U.S.), Anthelio Healthcare Solutions, Inc. (U.S.), Cognizant Technology Solutions (U.S.), Dell, Inc. (U.S.), HCL Technologies (India), Hewlett-Packard Company (U.S.), International Business Machines (IBM) Corporation (U.S.), Infosys Limited (India), McKesson Corporation (U.S.), Siemens Healthcare (Germany), Tata Consultancy Services Ltd. (India), Wipro Ltd. (India), Xerox Corporation (U.S.), Epic System (U.S.), and Computer Sciences Corporation (U.S.). 8.3 Allscripts Healthcare Solutions, Inc.